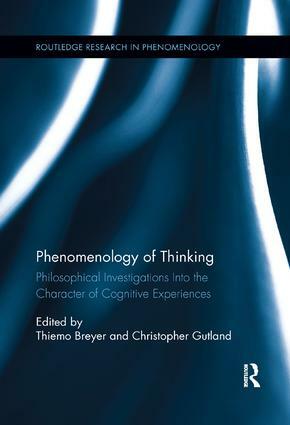 This book draws connections between recent advances in analytic philosophy of mind and insights from the rich phenomenological tradition concerning the nature of thinking. By combining both analytic and continental approaches, the volume arrives at a more comprehensive understanding of the mental process of "thinking" and the experience and manipulation of objects of thought. Contributors scrutinize aspects of thinking that have a common grounding in both the phenomenological and analytic tradition: perception, language, logic, embodiment and situatedness due to individual history or current experience. This collection serves to broaden and enrich the current debate over "cognitive phenomenology," and lays the foundations for further dialogue between analytic and continental approaches to the phenomenal character of thinking. 10. What Is It to Think? 11. Moral Perception: High-Level Perception or Low-Level Intuition? Routledge Research in Phenomenology publishes volumes that relate phenomenological arguments and ideas to a broader range of current philosophical problems. It also offers more historically informed studies of themes and figures from the phenomenological tradition, with the aim to be a rich resource of new ideas and approaches that promise to enliven contemporary debates. Clearly written and rigorously argued, these books ensure accessibility to a broad philosophical audience and to theorists working in other disciplines.